SHIRLEY, Long Island (WABC) -- One woman is under arrest, and another is seriously hurt after a crash at a gas pump on Long Island. 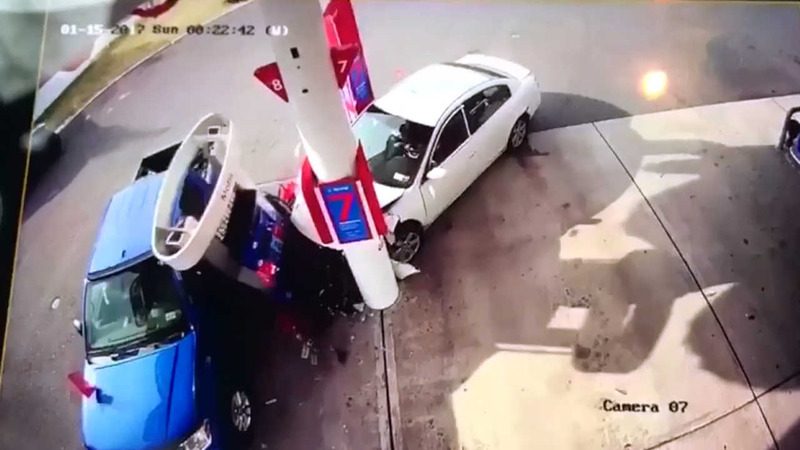 Police say the driver, Renee McKinney, was on drugs when she attempted to make a right turn into a gas station in Shirley Saturday morning, missed the turn and struck a gas pump, knocking it over. Rosalie Koenig, who was pumping gas on the other side of the pump, became wedged between the pump and her vehicle, a 2014 Nissan Frontier. Officials say Koenig, 62, of Mastic was hospitalized in serious condition. McKinney was hospitalized as a precaution. A passenger in her vehicle was not hurt. McKinney is charged with driving while ability impaired by drugs.